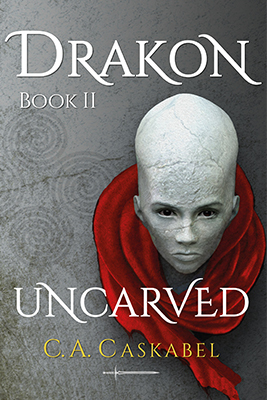 “Uncarved” is Book II of the epic fantasy novel Drakon. Fourteen-winter-old Da-Ren joins the Uncarved, the chosen few destined to lead the Tribe. More than forty children train and compete for the next five springs; only one will become Khun and fulfill the Tribe’s destiny. Da-Ren’s ambition and strength will keep him alive but can he overcome his most powerful and cunning adversary, the one favored by witches and men? The Goddess and the Ouna-Mas will try to nest in his heart, but is he prepared for the one woman he is brought up to hate? As war and hunger strangle the Tribe, the stakes of love, duty, and betrayal are higher than ever. A young man’s first kill. A young man’s first kiss. A coming-of-age tale with non-stop action.